NEW YORK – Carlos Menchaca, chair of the City Council’s Immigration Committee, El Diario journalists, NewsGuild of New York President Peter Szekely and other NewsGuild members will come together on Wednesday, Jan. 27, at a press conference in support of local ethnic media in NYC. Though these newspapers are private companies, they hold a particular public trust. 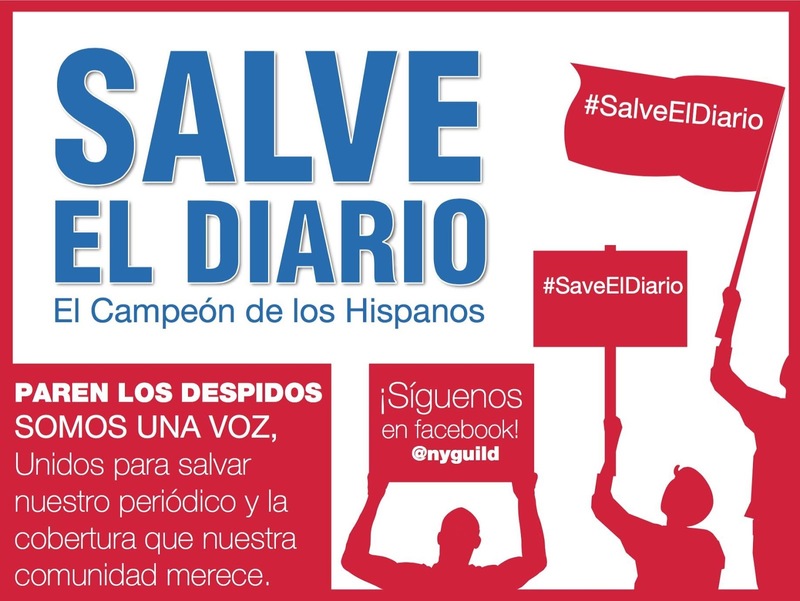 The possible closing of the print edition of El Diario and the consolidation of local news coverage into aggregated digital content at the oldest Spanish-language daily in the United States, represent a real loss for New York’s Hispanic communities. The press conference will be held 30 minutes before the start of NYC Council hearings at 10 a.m. on Jan. 27 to explore the future of community-centered ethnic media in the city. When: Wednesday, Jan. 27, at 9:30 a.m.
On Jan. 15, El Diario’s parent company, ImpreMedia, laid off nearly half of the publication’s editorial and sales staff—dealing a devastating blow to an already overstretched, demoralized newsroom. Thirteen employees received notice of their termination, which now threatens to close the 102-year-old publication’s print edition and cut off an invaluable daily news source for thousands of Spanish-speaking New Yorkers. El Diario is viewed as “The Champion of the Hispanics” in NYC’s Spanish-speaking communities. Many do not have access to digital forms of media, and would have no other way to learn about what’s going on in their neighborhood, their city and their country if the outlet ceased its print publication. The NewsGuild of New York, Local 31003 of the Communications Workers of America, a union founded by journalists 82 years ago, represents 2,800 members at New York City area news organizations and other companies.